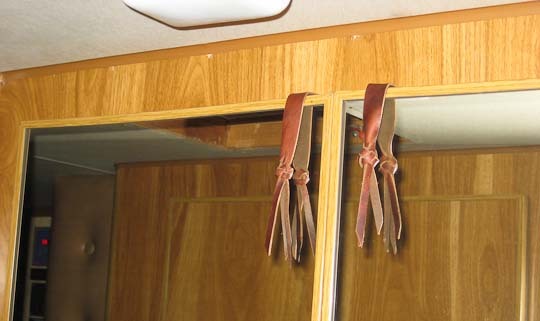 Lazy Daze Motorhomes have square plastic pulls or, on later models, rectangular ones glued on the mirrored doors of the wardrobe. At least in the Mid Bath models those doors are in a narrow hallway and the pulls can be quite annoying. I have a better idea. Leather straps. They'll catch a shirt sleeve or jacket pocket as you walk down the hall; and with some luck you can stop moving before the riiipppp. They have sharp edges too - those edges hurt. I wish now I had taken a picture of the pulls before I took them off so you could see what the problem is. But of course any Lazy Daze owner with these dratted pulls will be nodding their head by now anyway. When I saw Andy Baird working at replacing those dratted pulls in Skylark (he'd obviously had enough of them too). I instantly grabbed his idea (with his permission) and set right to work on my own version here in LD. Of course, me being me, I had to do it a little differently. Andy used loops of fabric screwed to the inside of each door at about the same height as the original pulls and arranged it so the loops protruded between the doors where a finger in the loop allows one to pull the door open. They work really well, and I set out to make mine in leather with buttons instead of loops. Then something unexpected happened. While worrying the dratted pulls off the glass I discovered that if you pull at the top or bottom of the door to open it it opens much easier than when pulling at the center where the pulls were. Well, duh! These doors are latched top and bottom and by pulling at the top or bottom the door springs a bit and one latch releases before the other instead of both at the same time. So as an experiment I hung my pulls over the tops of the doors. So far so good. Visually the look is nice and clean and makes the narrow hall feel a little less constricting. Functionally they work well and the doors open easily. I'm still working on retraining my arms to reach in the right direction for the pulls and that just take a little time. I think they are keepers. They're a little over the top, don't you think?